Never attempt to remove the radiator cap while the engine is operating. Doing so might lead to cooling system and engine damage and could result in serious personal injury from escaping hot coolant or steam. Turn the engine off and wait until it has cooled. Even then, use extreme care when removing the radiator cap. Wrap a thick towel around it, and turn it counterclockwise slowly to the first stop. Step back while the pressure is released from the cooling system. When you are sure all the pressure has been released, press down on the cap, using a thick towel, and continue turning counterclockwise to remove it. The coolant level should be full in the radiator and between F (Full) and L (Low) on the coolant reservoir tank when the engine is cool. 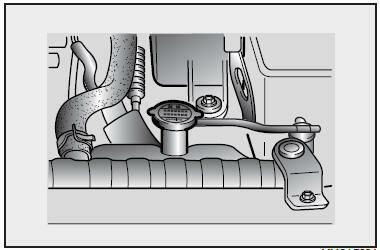 Check the coolant level using the dipstick attached to the reservoir cap. 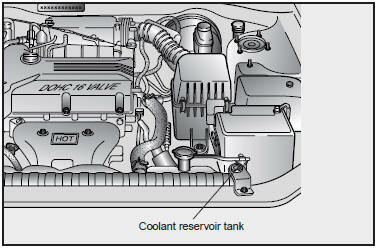 If the coolant level is low, add enough coolant to bring the level to F, but do not overfill. If frequent additions are required, see an authorized Kia dealer or another competent repair center for a cooling system inspection.